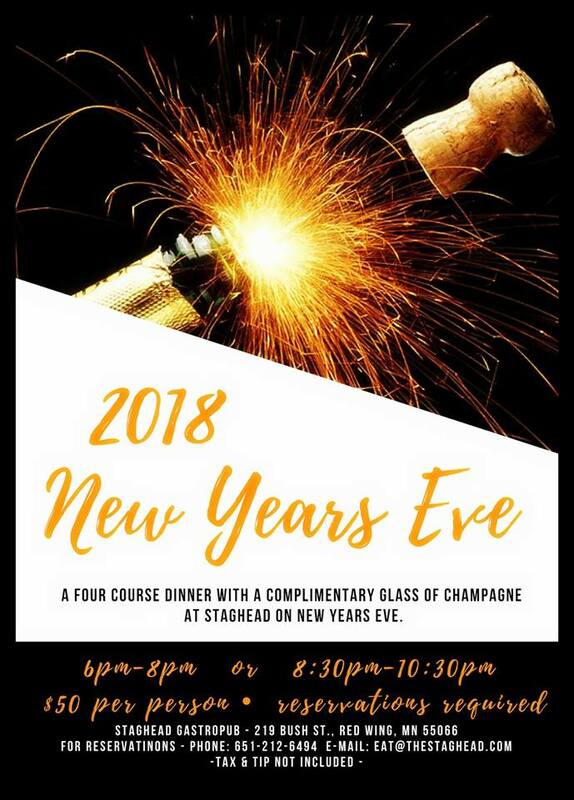 Enjoy a four course chef dinner at Staghead with your friends and family this New Years Eve. We will have two seating times, 6:00-8:00 pm (strict end) and 8:30-10:30 pm (not a strict ending time). All guests will receive a complimentary glass of Champagne. Our full drink list will be available. $50/person. Tax and tip are not included in the price. See below for a vague menu. There will be no live music for this event. Reservations are required. There are multiple ways to make one. Please call during business hours 651-212-6494, email eat@thestaghead.com, message on facebook, or make one when you stop in to dine with us!